I have been receiving this question on and off for several years now. This was one of the early shoots on the 900 series SONY HDCAM and I had to come up with some novel ways of lighting …. dancers, a constantly moving camera, nowhere to “hide” lights and no mounting as the caves are a National Park. The camera was relatively new at this point and even though it was only a few years back HD (as we now know it) was in it’s infancy and still not widely accepted. I had done many hours of testing on the camera with Jeff Cree from SONY, so had a pretty good idea of how far I could push it. Following is a synopsis of the shoot which was specifically to be delivered on HD. Face of America is an eight part series Produced by Wolftrap Foundation for the Performing Arts and presented as film in conjunction with a live performance at Wolftrap a few years back. Rob with helium balloon rehearsing movements with steadicam and dancers. 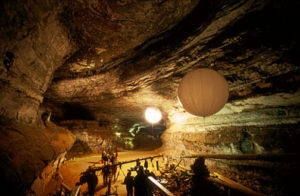 The shoot presented many challenges, not the least of which was shooting underground in the gigantic caverns which make up part of the more than 300 miles of caves and tunnels in the Mammoth Caves System in Kentucky. The concept of the Face of America series was to combine various art forms to draw attention to the 8 major National Parks in the US by having the country’s top performance artists stage sequences against the backdrop of the Parks. 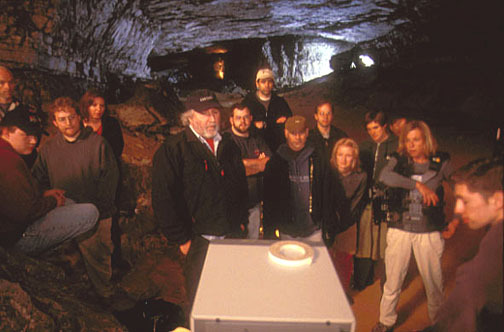 The staged sequences were filmed in Hi Definition and projected at a live performance at Wolftrap with the live artists on stage interacting with those in the filmed sequence playing in the background. Rob and Doug watching rehearsal of camera and dancer movement. Doug is a totally visual choreographer and from the outset he wanted the camera to be a participant in the dance. 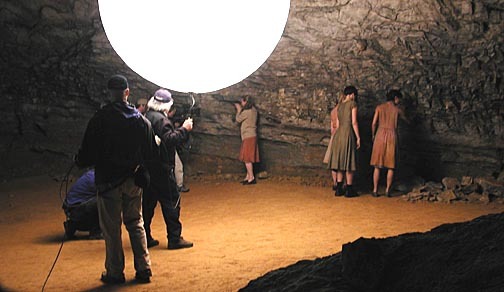 He envisioned the camera as part of the performances in the different sections of the caves so the camera was choreographed into the dance sequences becoming another member of the ensemble. Doug’s visualization of the number and realizing the vision provided some elegant staging but presented several unusual lighting challenges. Freeing the camera meant having the camera almost constantly on Steadicam (Operator-Sheila Smith) so it could move along with and amongst the dancers. Lighting became a challenge as there was literally nowhere to put lighting units without them being seeing. As the Caves are a Notional Park no mounting of any kind was allowed so hiding lighting units became a major challenge. This was compounded by the scale of the caves. Using smaller hand held units close to camera would not do the trick as the backgrounds would simply fall off to black. My goal was to not only have the dancers and camera moving but also have the lighting moving so we could see shadows moving across the background keeping the entire image “alive”. 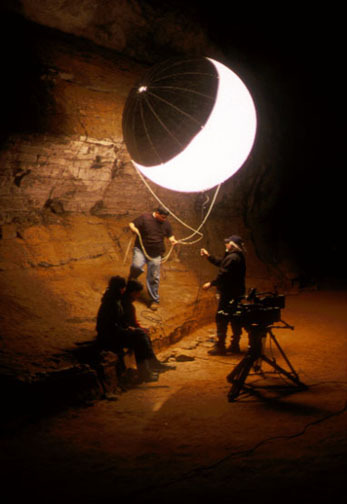 One of my favorite lighting tools is helium balloons, which I had been using for many years and, having used them extensively on the TV Series ED, I decided this was the obvious solution as the light could be hidden from view almost regardless of camera angle whilst providing a large, diffused soft source. The challenge then was to keep it from becoming flat AND to maintain some consistency in exposure with the Dancers moving through a large area. Rob and Eric (from Available Light NYC) with "skirted" balloon. More important however was the balloons could be moved during the shot so we could choreograph the dancers, steadicam and lighting into one fluid dance. Moving the balloons also allowed me to place “skirts” on one side of the balloon so the light was not only soft but directional. This gave me the moving shadows I was after, the soft source keeping them subtle rather than harsh as they would have been if using a hard source. The result was I choreographed the movement of the light into the dance so the whole piece became a fluid interaction of dancers, camera and lighting fulfilling Doug’s vision of the dancers playing to camera in such away that they would appear to be interacting with the dancers on stage in the live performance. For anyone who has been to Mammoth you will understand the scale of the operation. The caves are simply gigantic, very hard to even describe their scale. To add depth we placed hard lights way off in the distance which meant running thousands of feet of cabling. Units had to be kept small as we were tied in to the caves power so most of the units were 1.2K HMI’s (mostly PAR’s) to give some punch at low amperage and good spread. As the camera was relatively new at this stage I drew on some film technique to help out. On film I very often used the Varicon and worked at very wide apertures. This was an obvious place to do the same so I could get as much shadow details as possible without resorting to high gain, and therfor , increased noise in the image. Crew and dancers watch playback. Essentially the Varicon acted in much the same way as pre flashing the negative. This gave 1-2 stops more underexposure latitude and in many cases meant I could work without fill light, especially when working at T1.3 on super speeds. To simulate this look I had done a lot of testing on the SONY so pushed the pedestal on the camera up just a few percentage pints and and raised the gamma slightly. Both were increased enough to allow a little more latitude in the shadows but not enough to significantly increase noise. I could use this technique in film and video as I always followed with a detailed color grading session so the idea was to expose for the shadows knowing I could tighten the image up in the grade. For anyone contemplating using this technique be aware that the result yields images very similar to shooting in log C. The image will be milky and appear washed out and they do require contrast and ped adjustments in post. Got questions? Shoot them off and I will respond. 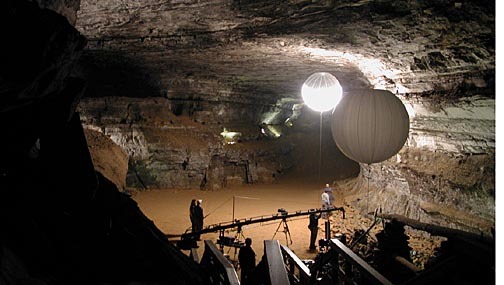 This entry was posted in FAQ's, Lighting and tagged 35mm, arriflex, black & white, cameraman, cinematographer, cinematography, digital cinema, director of photography, doug varone, face of america, hi definition, mammoth caves, rob draper acs, wolftrap. Bookmark the permalink.